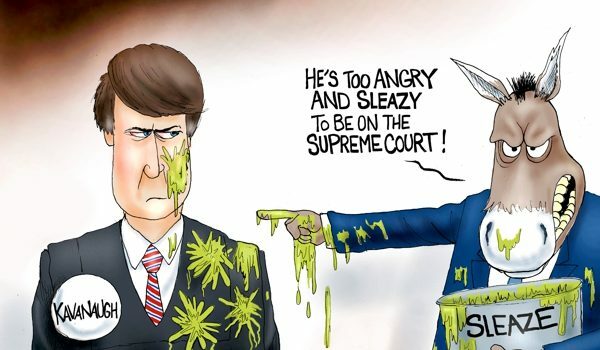 A below-the-belt attack on the Kavanaugh family by a political cartoonist has gone viral in the last 48 hours. In it, cartoonist Chris Britt, editorial cartoonist for the Illinois Times, depicts Brett and Ashley Kavanaugh’s 10-year-old daughter saying her nightly prayers. 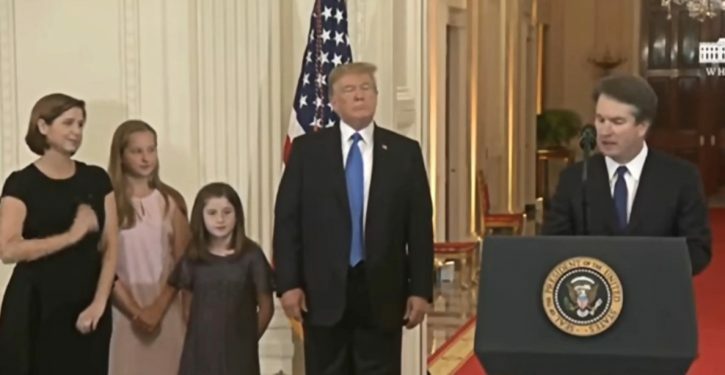 During the Senate hearing last Thursday, Judge Kavanaugh had spoken of his daughter wanting to pray for his accuser, Christine Blasey Ford, when she said her prayers at night. He choked up a little over the wisdom from such a youngster, evoking, for many Christians, the admonition of Jesus from the Sermon on the Mount to “love your enemies and pray for those who persecute you” (Matthew 5:44, NIV). Dear God, forgive my angry, lying, alcoholic father for sexually assaulting Dr. Ford. Nothing implied about Kavanaugh in the cartoon has been proven or even had credible evidence presented for it. 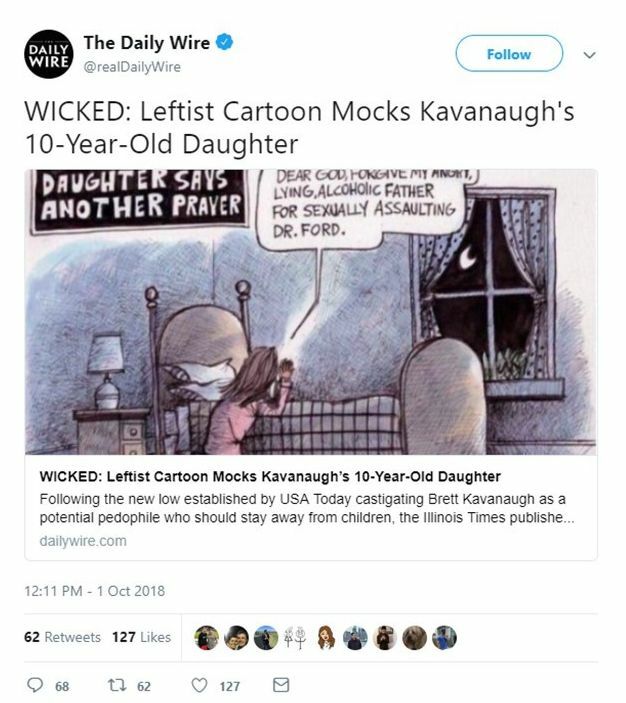 Daily Wire is certainly not the only site to characterize this as “wickedly evil” and “grotesque.” But the cartoonist, Mr. Britt, is no stranger to cynically dragging people’s children into shock-talk political cartoons. Some years after the Oklahoma City bombing attack, Britt sketched another cartoon, based on the instantly iconic image of fireman Chris Fields carrying in his arms baby Baylee Almon, rescued from the rubble of the Murrah Federal Building in April of 1995. Time magazine had put that image on its cover in 1995, and for many Americans it was a symbol of sanity and hope after the horrific attack by terrorist Timothy McVeigh that killed 168 people. It was an image to unify around, one that conjured life and rebuilding for the future. You can’t find that cartoon online now. It took hunting down an old archived page from the Rush Limbaugh show and making a screen capture to bring it to you for comparison. The original Limbaugh broadcast for which the image was added occurred in March 2009, just after the Britt cartoon came out. In the broadcast, Limbaugh featured an audio clip from a Seattle radio host, the city where Chris Britt was working at the time. 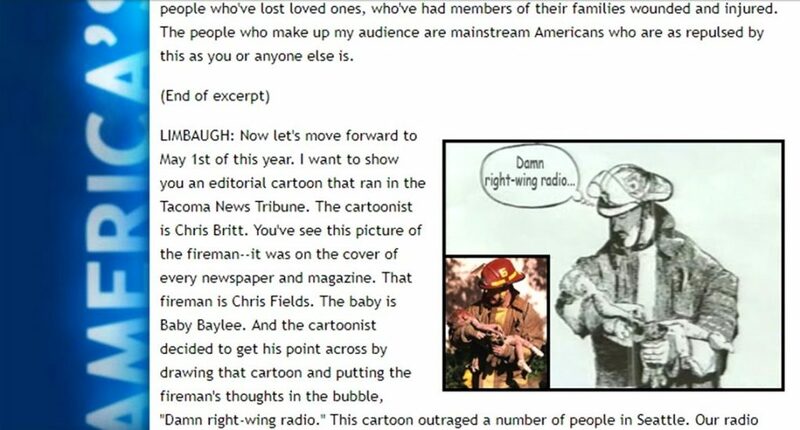 The cartoon had upset a lot of people with its cynical take on the fireman and baby, and the Seattle host, John Carlson, fielded numerous calls from them and devoted much of one of his radio programs to the topic. 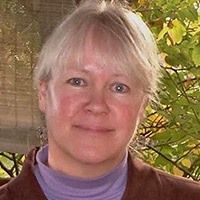 During the conversation, radio host Carlson raised the point that in the memorial events in 1995, then-President Bill Clinton had berated right-wing radio as bearing responsibility for the bombing attack. Mr. JOHN CARLSON (KVI-Radio): What do you think of that cartoon? Mr. CHRIS FIELDS (Oklahoma City Fireman): D–yeah, well, I–I wouldn’t want to talk to him on the telephone, I’d just like to meet him one time this–this cartoonist. That–that’s–that’s the most ludicrous thing I’ve ever heard in my life. I–I would say if you could probably get McVeigh to ever answer a question, he probably never listened to Rush Limbaugh or anything like that. He may listen to those ultra, ultra conservatives. I know–everybody at my station, we listen to Rush Limbaugh everyday. None of us have any intention of going and bombing any building or anything. Mr. CARLSON: You’re a fan of Ru–Rush Limbaugh? Mr. FIELDS: Oh, I imagine. Yes, sir. 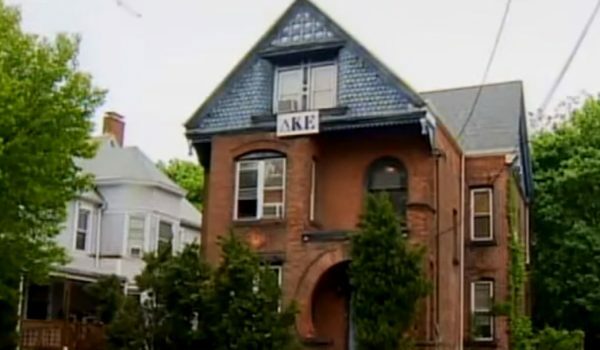 Mr. CARLSON: I distinctly remember Rush Limbaugh when–when talk radio was under attack from elements of the mainstream press and–and others–politicians here and there, and some would think President Clinton–he–he made a point of saying that he considered him–he considered his show to–to be reflecting the values of the rescuers themselves, not the people who made the rescue necessary. Mr. CARLSON: And–and that he held you guys up as heroes and that he was proud to count you guys as supporters. Mr. CARLSON: And–and you appear to be validating that. Mr. CARLSON: Wanted to see if it would stick. Mr. FIELDS: …by a lot of people. So immediately his people ran out and, you know, covered–covered the bases by saying, Well, now we weren’t talking about Rush Limbaugh or’–but he was. The smear attempt by Clinton was 23 years ago. As Chris Fields says, Clinton’s communications team tried to walk it back at the time. But in the 23 years since, something has changed on the Left. It no longer walks back over-the-top gambits like using tender moments with real people’s children to make harsh, divisive political points. For too much of today’s Left, nothing is off-limits when it comes to making the political personal and seeking to dehumanize its perceived enemies.